1 A None No Power Seat 1 A has some extra legroom. The tray tables are in the armrests, making the armrests immovable and slightly reducing seat width. There is no floor storage for these seats during takeoff and landing. 1 C None No Power Seat 1 C has some extra legroom. 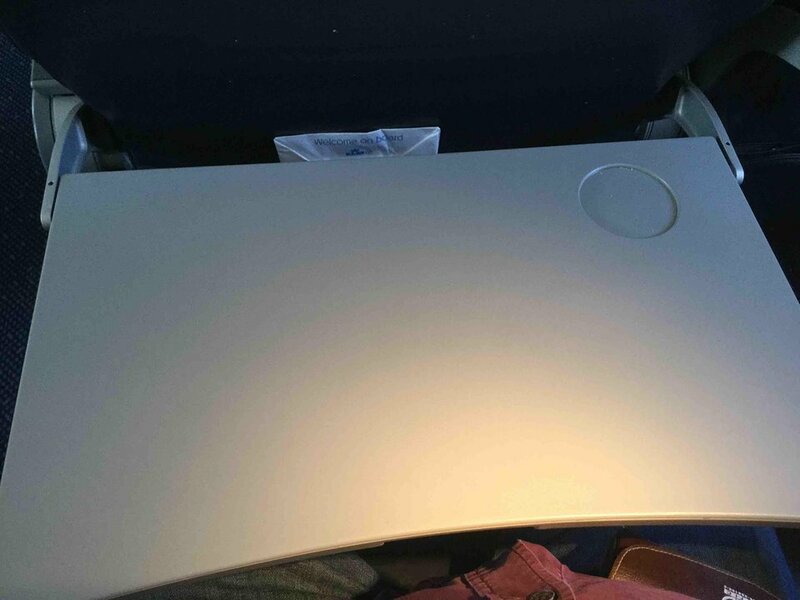 The tray tables are in the armrests, making the armrests immovable and slightly reducing seat width. There is no floor storage for these seats during takeoff and landing. 1 D None No Power Seat 1 D has some extra legroom. The tray tables are in the armrests, making the armrests immovable and slightly reducing seat width. There is no floor storage for these seats during takeoff and landing. 1 F None No Power Seat 1 F has some extra legroom. The tray tables are in the armrests, making the armrests immovable and slightly reducing seat width. There is no floor storage for these seats during takeoff and landing. 10 A None No Power Seat 10 A does not recline due to the exit row behind. This seat is missing a window. 10 C None No Power Seat 10 C does not recline due to the exit row behind. 10 F None No Power Seat 10 F does not recline due to the exit row behind. This seat is missing a window. 11 A None No Power Seat 11 A is a preferred seat and KLM charges an additional fee to sit here. The seat has extra legroom due to the exit row. 11 C None No Power Seat 11 C is a preferred seat and KLM charges an additional fee to sit here. The seat has extra legroom due to the exit row. 11 D None No Power Seat 11 D is a preferred seat and KLM charges an additional fee to sit here. The seat has extra legroom due to the exit row. 11 F None No Power Seat 11 F is a preferred seat and KLM charges an additional fee to sit here. The seat has extra legroom due to the exit row. 26 A None No Power Seat 26 A is a standard Economy seat in the last row of the aircraft. The proximity of the lavatory and galley can be bothersome. 26 C None No Power Seat 26 C is a standard Economy seat in the last row of the aircraft. The proximity of the lavatory and galley can be bothersome. 26 D None No Power Seat 26 D is a standard Economy seat in the last row of the aircraft. The proximity of the lavatory and galley can be bothersome. 26 F None No Power Seat 26 F is a standard Economy seat in the last row of the aircraft. The proximity of the lavatory and galley can be bothersome. 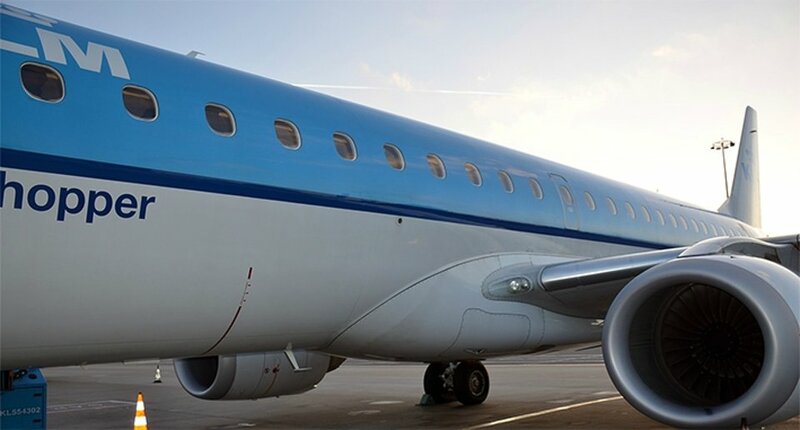 KLM's Embraer ERJ-190 provides comfort in both Europe Select Class and Economy Class. This aircraft is used for short-haul flights and seats 100 passengers. Leather seats arranged in two by two seats per row invite passengers to sit back and enjoy the flight. This aircraft also features KLM's Economy Comfort seats. These seats are part of the Economy class cabin but feature an extra 2 inches of legroom. These seats are available to Flying Blue Platinum members and passengers flying on full Economy class tickets at no extra cost. Flying Blue Gold and Silver members receive a discount while other passengers will pay an extra fee for access to these seats. This is an Economy Comfort seat (7D) which incurs an additional charge, but if your 6'3" 19st man then definite worth the small extra, even if it was only just over an hour (although Exit Row 11 has even more room if you can book those). Each outbound and inbound flight i did on the E190, you got given a snack and a 86ml carton of water. You were also asked, when the trolley came to your seat, what else you'd like to drink. There were soft drinks, water, tea/coffee, as well as red/white wine and i am not sure why but beer wasn't available in either of the flights. Overall great expereince with KLM! Lots of leg room especially for 6'3" 19st man.....loads of room stretch out! As others have said, no underseat storage, but if the overhead storage is full and you do need to place it under the seat, the flight attendant will stow your bag at the front of the plane for you (as they did in our case). If you have brought two bags i am sure that they would do the same as well. Window was sort of aligned, but if you wanted to look straight out of it you would need to lean forward slightly. 11A exit row is good for leg room. A few small minuses, tho: no underseat bag placement for takeoff and landing. I think the seat cushion is also shorter (less thigh support) to make the exit space wider. Fine for 90 min flight. The space on this seat is very genorus. It have the larges table I have seen in years. Its no need to pay extra for seats if you are not very tal. This is bulkhead seat in Business Class which is the best place to sit in my opinion. Although Business Class really is a joke on this small plane -- the seats are tiny, narrow and exactly the same size as in Economy with a little bit more pitch and thus some legroom. But I never understand how KLM can call these tiny seats "Business Class." We flew a short flight from Cardiff - Amsterdam and service was fine but nothing special. My husband had 1D next to me and these seats are Green/Yellow on the SeatGuru chart because of proximity to galley; but we believe on these short haul flights, when a big sleep isn't happening anyway, proximity to the galley is fine with the extra legroom at the bulkhead. Of course, no underseat storage at bulkhead, but no problem for us to find bin space above. Bulk head seat, great space, the tray is in the armrest, so little bit unstable. Decent legroom in 6F. Window alignment is OK, you have to lean forward a little bit. Rows 7 & 8 windows are more misaligned but useable. I flew from Zagreb to Amsterdam a few days ago with KLM, and I have to say that it was rather enjoyable. 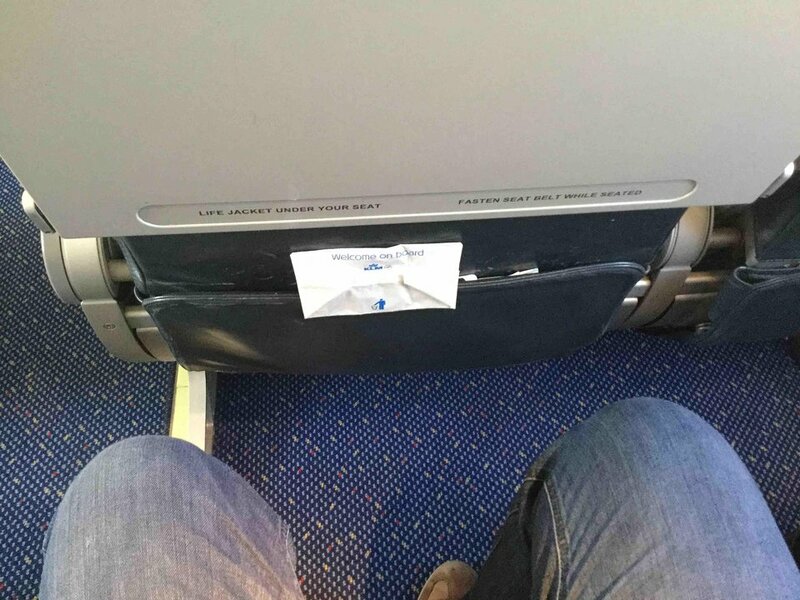 I was seated in Economy Comfort, so I had a few extra inches of seat pitch. Service was very nice, and the plane (Embraer 190) was amazing. I was impressed with the overhead bins; my oversized (23") carry-on fit in. Overall a very nice, short flight with KLM. OK for 1.5 hours, but seat pitch horrible -- even for a not-so-tall person (177 cm). 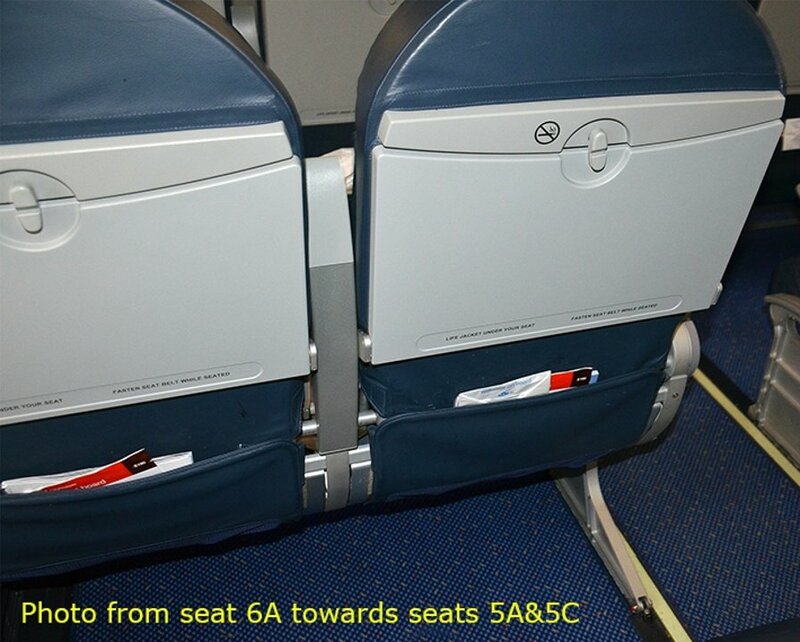 6A was worth the small upgrade cost to Economy plus. Spacious, loads of legroom. Very happy! First row in economy on the E190, so handy for getting off quickly, and quicker food service. The lack of a middle seat doesn't sound like much, but it does make a big difference, as even a small aircraft seems more spacious. Having transferred from a 777-300 in AMS, so this was a nice end to the journey. Embraer economy is in my limited experience always quite comfortable. Also this KLM version is decent for short haul flights. AMS-FLR Business 1F The number of business class rows changes each flight. Quite disappointing the fact that the seat near yours is often occupied! This seat was not bothersome at all. On my flight from AMS to MUC, which was only 1 hour, there was no need to recline the seat at all. 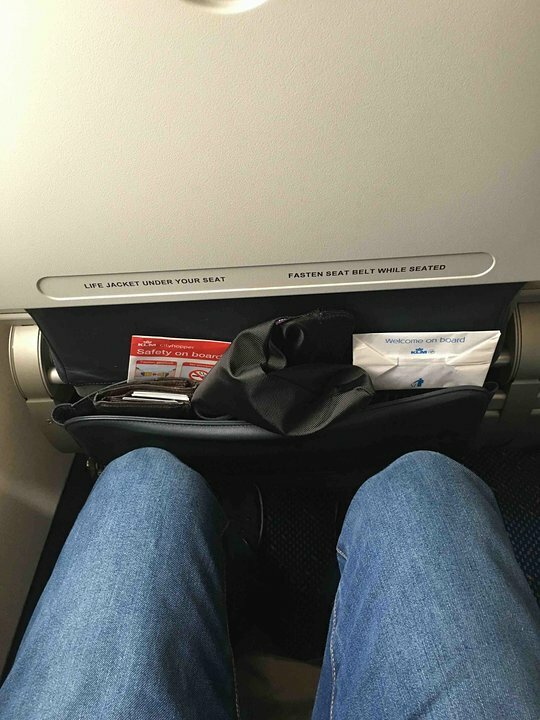 With the Embraer plane I feel like I have much more legroom compared to the Boeing 737 planes KLM uses on this flight as well. I always try to book KLM Cityhopper flights instead of regular KLM flights in Europe, as the Fokker & Embraer planes are much more comfortable. This is the first row of the regular economy cabin and is a decent all-round seat. Being near the front helps you get off quicker, but you won't find it hellish onboard. The 2-2 layout gives the cabin a comfortable, spacious feel. My short flight was the ideal start to a long-haul journey with KLM. Having had the rather comfortable experience of flying the E190 a couple of times, I start finding this aircraft as one of my present day favorites. Although the standard economy seats are as on most other planes, you have either a window or an aisle seat. The cabin is much more spacious and quiet compared with other narrow types like the CRJ900. I'm picking the E190 over all other short range aircraft given a choice. KLM service is equal to most other "flag carriers" these days, but ok for what you get. Recommend you pick this one over A320/B737/CRJ900/B717 if given a choice! KLM flies 1 versions of Embraer ERJ-190 (E90).